About the Product – Tresemme is one of the prestigious brand names in world of Hair Care which is owned by Unilever. Tresemme has wide range of shampoos and conditioners and this is one of its types. Packaging – It comes in satin red color bottle with golden color font in front. I got the one with pump on top as I find it more convenient. It also comes in flip top caps. The bottle is quite sturdy and pump is of awesome quality. When you buy a product which has pump on top always make sure to check if it’s made of strong plastic, otherwise pumps break easily and then squeezing product is big pain. I didn’t like its flip top caps as sometimes it gets jammed and then it’s really irritating to squeeze shampoo by removing whole cap. 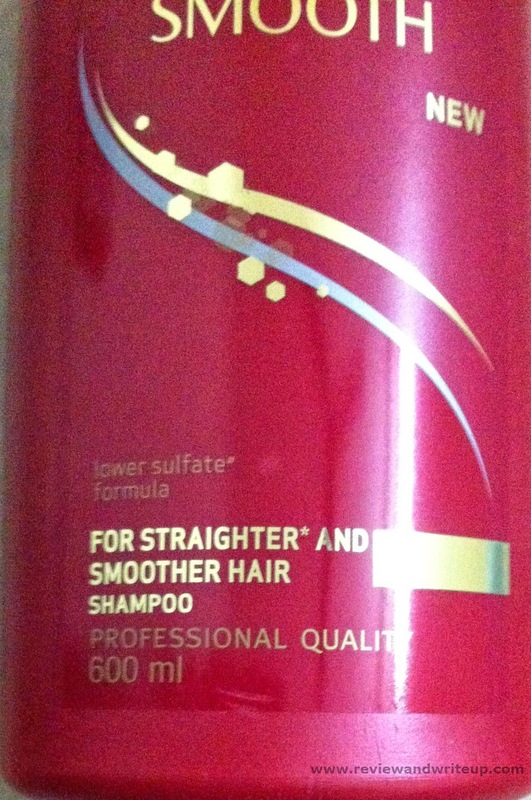 Claims of the product – Shampoo have lower sulphate formula. It claims to make hair smooth and straight. Its Keratin Smooth formula helps restores keratin and gently cleanses to leave hair clean, shiny and manageable. My experience – I opted for this shampoo as my hair gets frizzy, crumbled the minute they are dried after hair wash. I wash my hair thrice a week. Shampoo is white in color, not runny and of great consistency. It lathers up easily, so does washes away. I have been using this shampoo from last two weeks and I can say the results are superb. My hair has learnt to stay calm with help of Tresemme. Otherwise on a windy day (like these days) I look like a girl who just got an electric shock, haha. I love its enchanting smell. You know the smell which lingers in your hair and scalp post hair spa, yes the similar one comes from Tresemme. So I have to agree to their claims of salon type treatment. Since it has lower sulphate formula which means less lather formation so I have to take just a little more for my hair. I apply to wet scalp, massage gently and then wash away. It leaves my hair smooth, silky soft. I don’t want to come out of shower because of its amazing fragrance. I feel if I could fill the world with this fragrance (dreamy me). That silky smooth feeling stays in hair after wash for next two days. My hair looks shiny and straighter as compared to before. My hair don’t tangle much after Tresemme wash. However its fragrance doesn’t last long but if you wash your hair regularly with Tresemme your scalp won’t smell. Availability – Nearby stores, I paid Rs. 400 to shopkeeper when it was available online for much less. To buy online at discounted rates please click here. R&W Recommendation – If you want shiny, straight hair than Tresemme is for you. Always invest in good shampoo, and Tresemme is one such product.